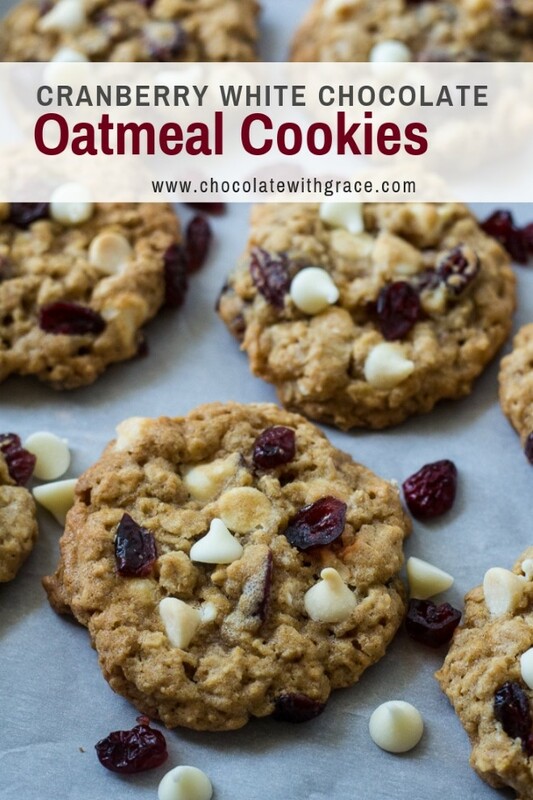 These oatmeal cookies are exceptional and combine the best of the oatmeal and chocolate chip cookie worlds with the addition of white chocolate chips. Instead of the traditional raisins for oatmeal cookies, I added cranberries. There is something about the zing of the cranberry that beautifully pairs with the sweet white chocolate. My family said they were some of the best cookies they had ever eaten. These cookies don’t require a mixer and the chilling time is limited, making them quick to stir-up and bake with minimal dishes afterwards. Actually, it is important not to chill the dough for too long. Leaving the dough in the refrigerator for several hours hardens the dough too much and the cookies won’t spread. About 30 min of chilling is ideal, it firms them up just enough to keep them thick. 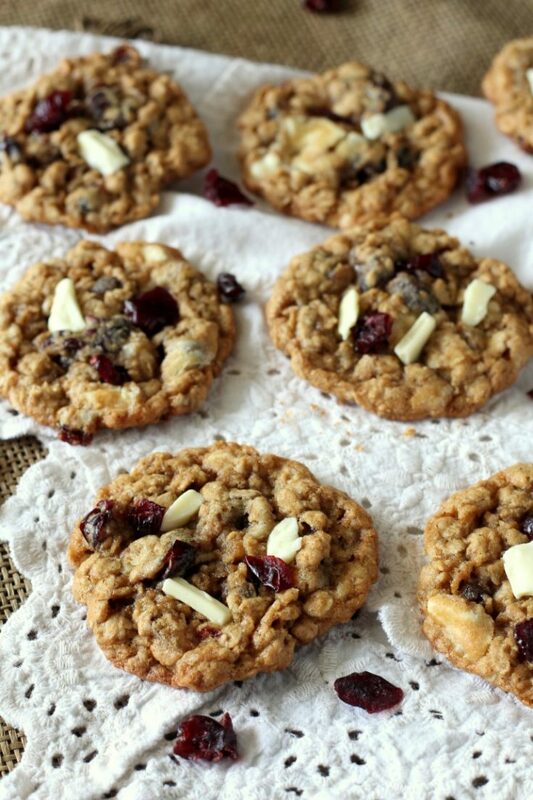 If you’re not a cranberry person, you can try my chocolate chip oatmeal cookie recipe. 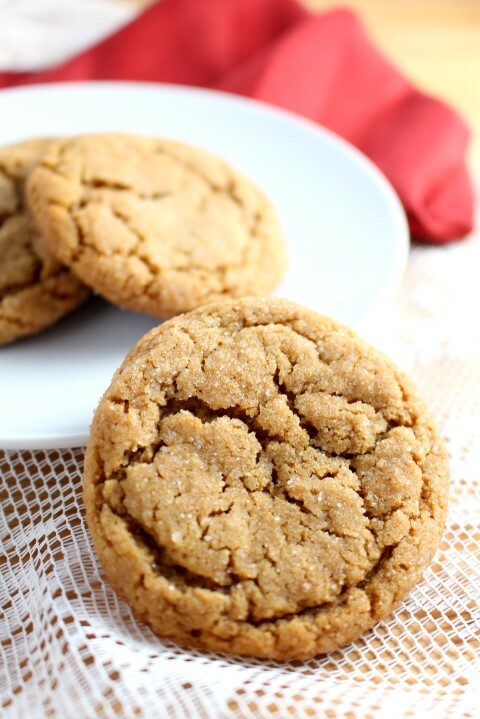 It uses brown butter to make them extra special. 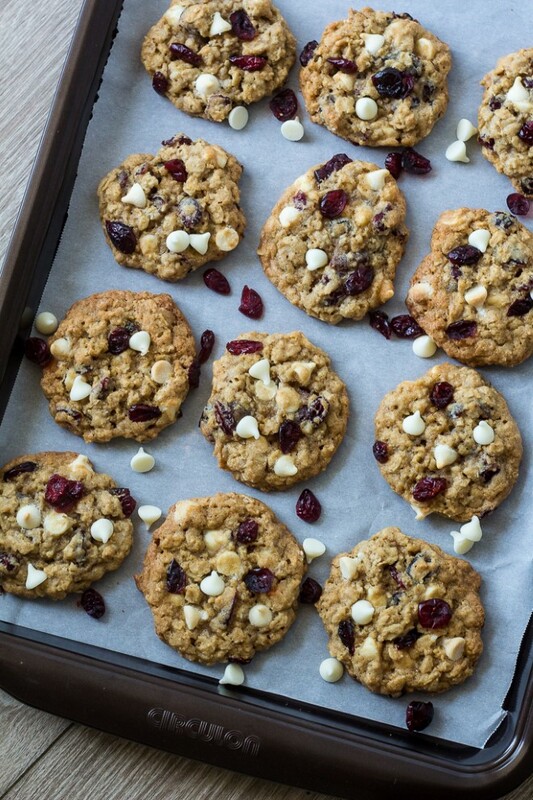 In fact you could use that recipe and substitute white chocolate chips and cranberries for the chocolate chips. In a large bowl, cream butter and white and brown sugar until smooth. Beat in eggs, molasses and vanilla. Combine the flour, cinnamon, baking soda, and salt in a separate bowl. Stir the flour mixture into the butter and sugar bowl. 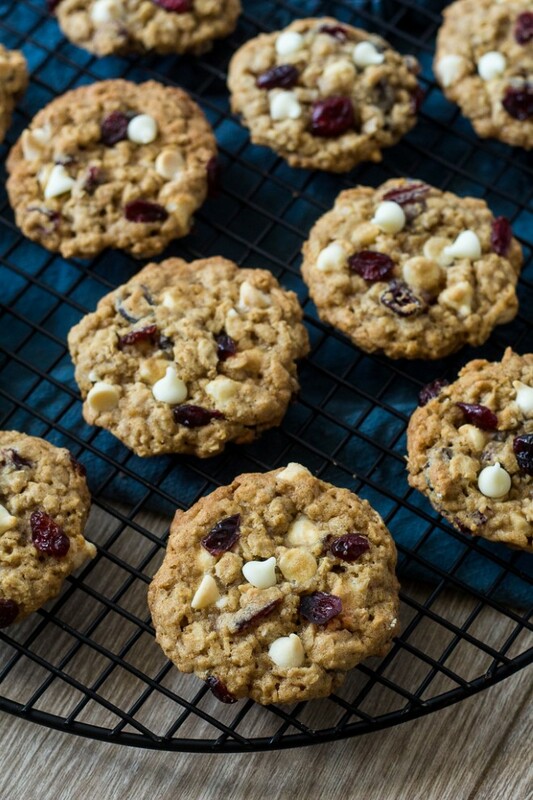 Gently stir in rolled oats, white chocolate chips and cranberries. Roll the dough into balls and chill for about 30 min. Preheat the oven to 325 F. Bake the cookies for 10-11 min or until lightly browned. Do not over bake. Let cool on the cookie sheets for a few minutes and then transfer to a wire rack. 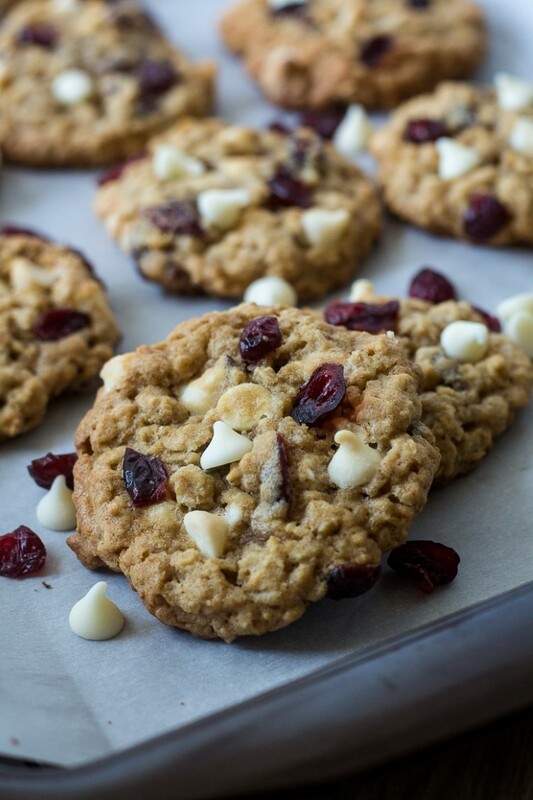 Are you looking for other white chocolate cranberry treats? Or these White Chocolate Cranberry Blondies from Six Sister’s Stuff sound easy to make in a pinch. My Cranberry Crumb Coffee Cake is also amazing! Try these other Cookie Recipes! These look delicious! Thanks for visiting Night Owl Corner….just stopping by to check out your blog too! These cooking are packed full of flavor! Love the cranberry! I’m pretty sure you created my perfect cookie! 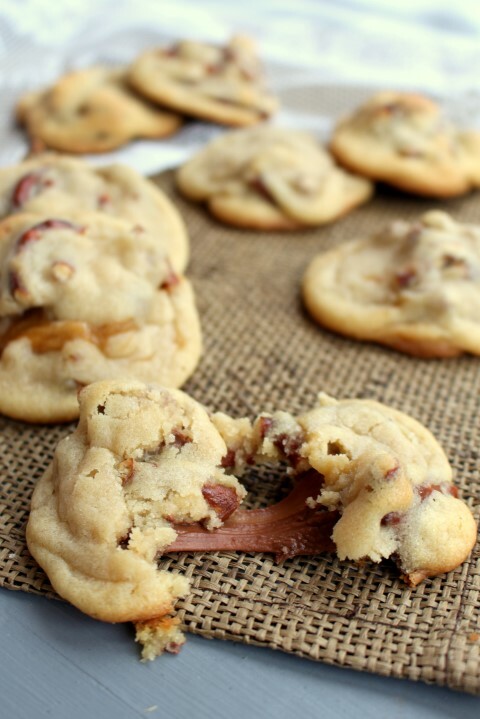 These are everything I love in a cookie and I cannot wait to try them! Beautiful! Thanks, Caroline. I hope you enjoy them as much as we did! 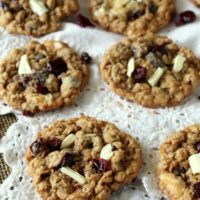 I love cranberries in cookies! These look great! 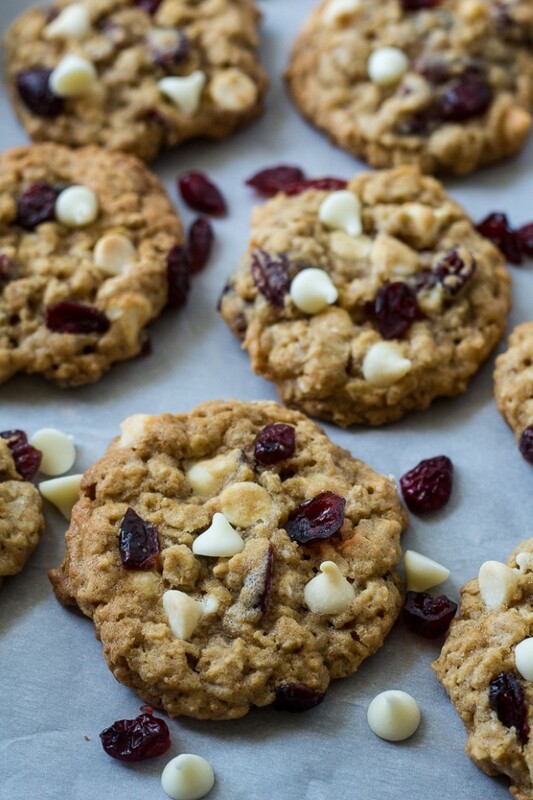 I just love cranberry and white chocolate together…add a little butter, brown sugar and oats and I’m a happy girl! These cookies look delicious! Thanks so much for linking them up to my Creative Ways Link Party! Wow these look absolutely delicious! 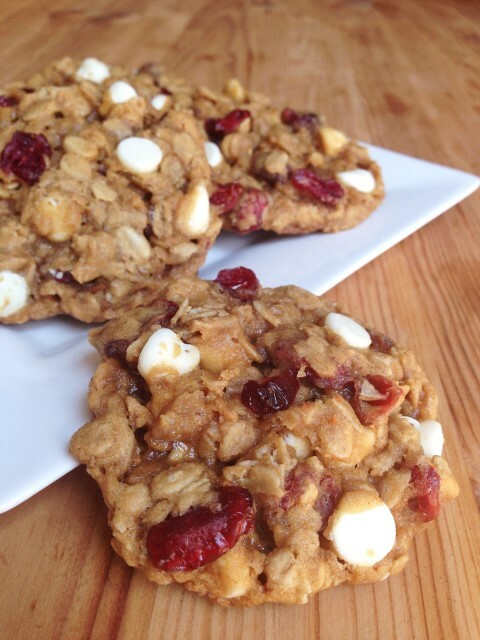 Thanks for sharing:) I have never tried cranberries in cookies before but I bet they are heavenly! These are great! I may even add macadamia nuts next time. I had cran strawberries on hand and used those. Thanks for sharing! Thanks for the kind comment, Debbie! I made these for Thanksgiving and everyone raved about them! I may or may not have eaten half of the batch myself… 🙂 They were to die for! Thank you for this delicious recipe! Thanks, Lexi! I’m glad you loved them! That sounds like a delicious combination as well. Thanks, Heather! I was wondering if you have ever made these without the white chocolate chips? Not that chocolate isn’t always the best option. ??.?. I’m going to pin the recipe for later. I love recipes with white chocolate. Especially cookies, it makes them sweeter and more delicious!